2014 is the 100th anniversary of the PBB! 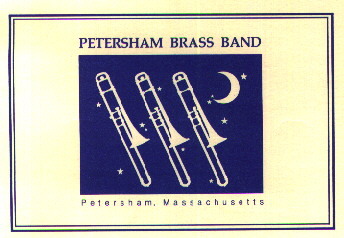 all concerts on the Petersham Band Stand at 7:30 p.m.
Ralph C. Mahar Regional High School. In 2007 the band celebrated it's 750th performace under a perfect summer's evening sky with Maestro Francis Wada conducting. The Petersham Brass Band, a community band of local musicians began performing for towns people as early as 1885 with periodic performances. Formed originally with only brass instruments, as was the style with the popular British Bands of the time, the Petersham Group added woodwinds as the years progressed to enable them to satisfy more complex scores being written. The Petersham Brass band really got underway in 1914 being revived by the late Rev. Robert Douthit. Other than a government mandated hiatus during World War II, the band has performed summer concerts every year since that time. The band used to play at the Petersham Agricultural Fair, which was held in September for many years. Their music has led the Memorial Day Parade and Services, as well as, sounding celebrations marking the ends of major wars. Along with the Summer Concert Season, Old Home Days, and the Christmas Tree Lighting and Concert, the band has also performed at major community celebrations noting the 175, 200, and 225 anniversaries of the town of Petersham. 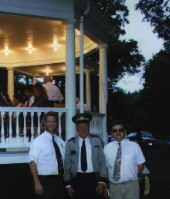 Many of the members of the band have graced the bandstand for decades upon decades. From new members out of the local high schools through ten, twenty, thirty, forty, and even fifty years' of service and beyond participation in a community band is an act of love. Al Gauthier, mainstay of the trombone section for the band for over 47 years was honored with a concert dedicated to him during the summer concert season of 1995.Gauthier took his first down beat on the band stand in 1948 under then conductor Basil Coolidge. Al played under three of the four conductors the band has had. Standing with Al are conductor Stu Britton, Gauthier, (in one of the Band's original uniforms from the 1950's), and band president Dana Robinson. Not long after the conclusion of the 1995 Summer Concert Season Al passed away. After sitting next to him in the trombone section for over 15 years, I will dearly miss my good friend, his humor, and his love for music and the Petersham Brass Band.